Planus Macerators offer quality engineering at unbeatable value – Italian engineered by a manufacturer with over 30 years of experience in the field. The Broysan and Geyser offer a solution whatever the scenario and full technical support is available from our team of highly skilled engineers. 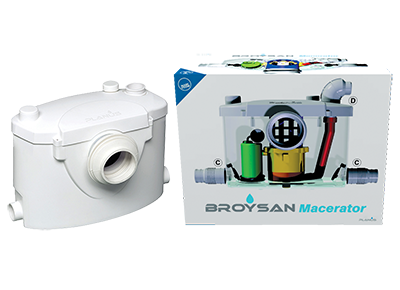 The Broysan pumps up to 8 METRES vertically, has an I P rating of 68 and is available at a fraction of the price of comparable products. The Geyser pumps up to 9 METRES vertically and processes water up to 100˚C!